Sure, it’s cold outside. 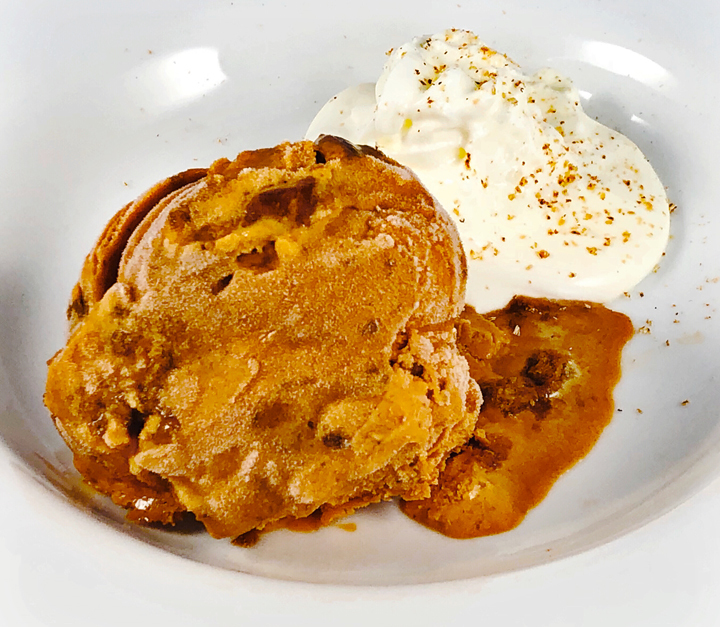 But we’re still eating frozen dessert because nothing beats the combination of freshly-made smooth and creamy pumpkin gelato and crunchy crushed gingersnap cookies. So get out that homemade ice cream freezer and join us. You won’t be sorry. 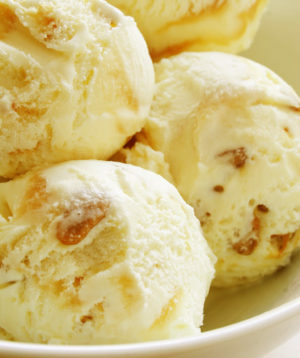 Freeze the work bowl of an ice cream maker according to the manufacturer’s instructions. Set a small metal bowl into a large bowl filled with ice. Beat together the egg yolks and sugars until light and airy. Slowly add half the warm pumpkin mixture into the egg yolk mixture, whisking to temper the warm mixture into the eggs. Pour the yolk/pumpkin mixture back into the saucepan and cook over low heat, stirring until the custard thickens and coats the back of a spoon. It should register between 170°F and 180°F on a digital thermometer. Pour the mixture into the small bowl set into the large bowl filled with ice; occasionally stir to cool the mixture, then refrigerate overnight. The next day, transfer the custard to an ice cream maker. Freeze according to the manufacturer’s instructions. When frozen, transfer to a container in thirds while layering in the maple syrup and crushed ginger snaps. Freeze for 3-4 hours before serving. Makes about 1 quart. 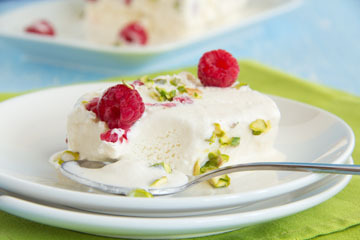 It’s hot out there and time to cool off with this tasty treat. 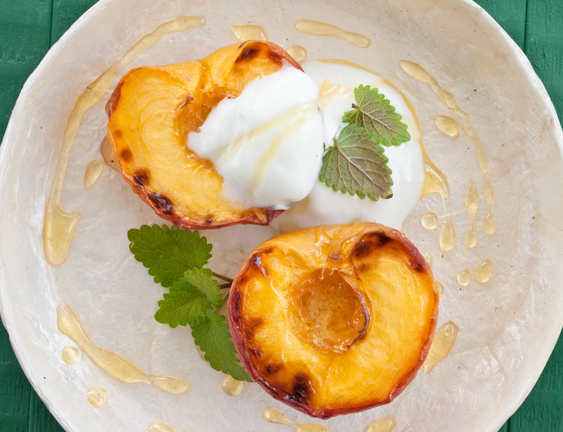 Deliciously creamy lemon gelato dotted with fresh seasonal peaches and stuffed in a crispy ginger cookie we coated in Bourbon Vanilla Sugar. 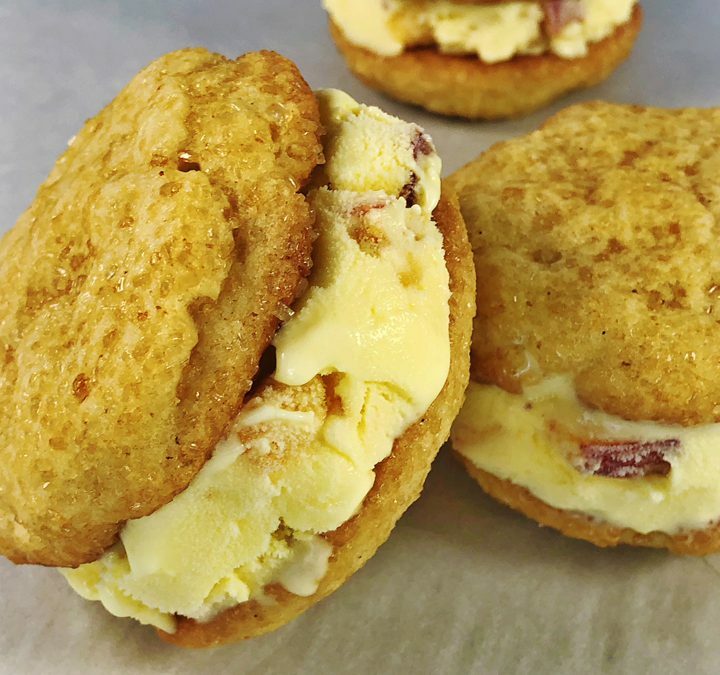 You can’t get any cooler than these summer ice cream sammies. In a medium bowl, whisk together the flour, baking powder, salt, and ginger. Using a stand mixer, or hand mixer, beat together the butter and sugar until the butter is light and fluffy and the sugar has dissolved. Add the egg, vanilla extract, and combine until smooth. On low speed, slowly add the flour mixture and blend until just incorporated. Cover and refrigerate the dough for a minimum of 4 hours or up to 24 hours. When ready to bake, preheat the oven to 375°F. Line two baking sheets with parchment paper. Roll the dough into 1” diameter balls, then roll the dough balls in the Bourbon Vanilla or Turbinado sugar. Place the dough 2″ apart on the prepared baking sheets. Use a flat-bottom glass or cup, flatten the dough balls to ⅜” thick. Place the dough in the oven and bake for 14-15 minutes or until lightly browned. Remove from the oven, and cool on the sheet tray for five minutes. Transfer to a rack to cool completely. Cut the peaches in half and remove the pit and any hard interior pieces. Cut the peach halves into a small dice. Place on a parchment lined sheet tray, in one layer, preferably not touching. Place in the freezer. Combine the milk and cream in the saucepan. Using a vegetable peeler, carefully remove in strips the yellow part only on the outside of the lemon and add to the saucepan with the milk/cream mixture. Place over medium heat and cook until steaming, be careful not to let the mixture boil. Remove from the heat, cover, and allow the lemon to infuse for 20 minutes. In a medium bowl, whisk together egg yolks and sugar until the mixture turns light yellow and the sugar has dissolved into the eggs. Pour the infused milk through a fine mesh strainer into the egg mixture, a small amount at a time, whisking until thoroughly combined. Pour the mixture into a clean saucepan, and place over medium-low heat. Stir constantly with a wooden spoon until a thick custard forms that coat the back of the wooden spoon, about 10 minutes. Be careful not to overheat. Place a smaller bowl in a large bowl filled with ice. Strain the custard through a fine-mesh sieve into the small cold bowl. Stir occasionally to cool the mixture, then cover and place in the refrigerator and keep cold until well chilled, about 3-4 hours or preferably overnight. Freeze in an ice cream maker according to manufacturer’s instructions. When the gelato is almost completed, add in the small diced frozen peaches. Place in a freezer container and freeze 2-3 hours. Set the gelato out of the freezer for 10-20 minutes or spreadable. 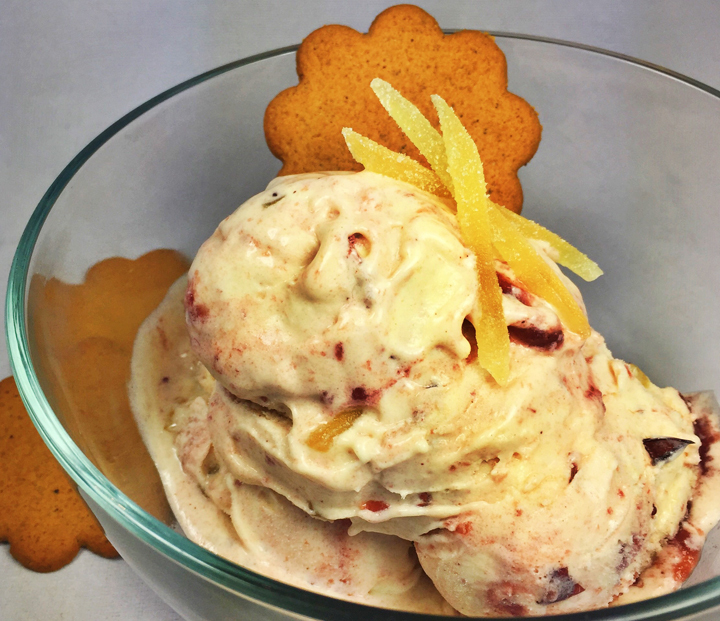 Spread two tablespoons of gelato on the side of one cookie. Top with another and freeze until solid, about 30 minutes. Make 10 cookie sandwiches with extra gelato.